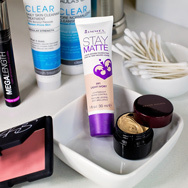 Avoid thick or solid makeup products like stick or creamy compact foundations. The types of ingredients that keep these products in solid or semi-solid form are iffy for those with breakout-prone skin. We understand the temptation to use solid foundations and stick concealers if you’re trying to conceal breakouts and red areas—they often offer the high-powered coverage you want—but, fortunately, there are plenty of alternatives. We share our favourites below. A flawless complexion starts with sun protection, and we know what it’s like trying to find the right SPF product when you’re afraid it will make you break out. Our RESIST Smoothing Primer Serum is an excellent option for acne-prone skin. With a clear, lightweight base that enhances smooth makeup application, this primer also provides sun protection and antioxidants—you get better-looking makeup and better-looking skin in one easy product! Finish with our RESIST Flawless Finish Pressed Powder to softly set makeup, while adding a hint of natural colour to refine skin.